An arrest warrant was issued late last month on a Martin County man after toxicology results found that he was under the influence when he was involved in a fatal May crash that took place in Washington County. 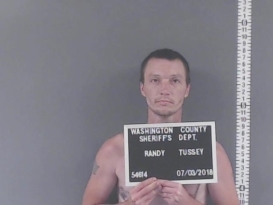 The Washington County Superior Court issued the warrant on 33-year-old Randy Tussey, of Shoals on June 29th after authorities say he was the driver of a 2003 Ford Explorer that was involved in a fatal car crash that happened on Mother’s Day on May 13th. In that crash, 35-year-old Jon Donlon, from Louisville, KY, was fatally injured. Tussey was arrested on July 3rd after officers received information he was hiding out in a camper off of Beck’s Mill Road in Washington County. Tussey is facing charges of operating a vehicle while intoxicated causing death, and two counts of reckless homicide. He is currently incarcerated at the Washington County Jail awaiting his first court appearance. Indiana State Police say the accident took place along US Highway 150 and Sinking Creek Lane in Hardinsburg. Be the first to comment on "SHOALS MAN CHARGED AFTER FATAL CRASH IN WASHINGTON COUNTY"